Our Junior Academy students (2- and 3-year-olds) spend their days exploring, sharing and learning in a warm and nurturing environment. Children are taught from a biblical world-view by highly qualified and caring staff who nurture an atmosphere where students learn to cooperate with others and grow in love and compassion for their new friends. Development of creative thinking and fine and gross motor skills is encouraged using carefully designed activities involving music, movement, art, stories and games. Through purposeful play, students grow in language ability and are introduced to foundational pre-reading skills, pre-writing skills, and early math skills as they discover the world God created. Our preschool program is certified by the Florida League of Christian Schools. Read more about the teachers, grades and courses in our Junior Academy. 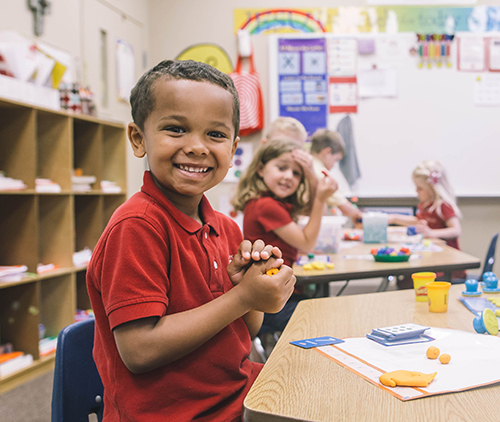 The PK-2& 3 program provides a great deal of flexibility as parents may choose to send children full or part-time three, four or five days per week. In addition to academics, our children learn foundational truths from Bible stories and gain enrichment through weekly music instruction. Please see the Tuition and Fees Schedule for days and times available.